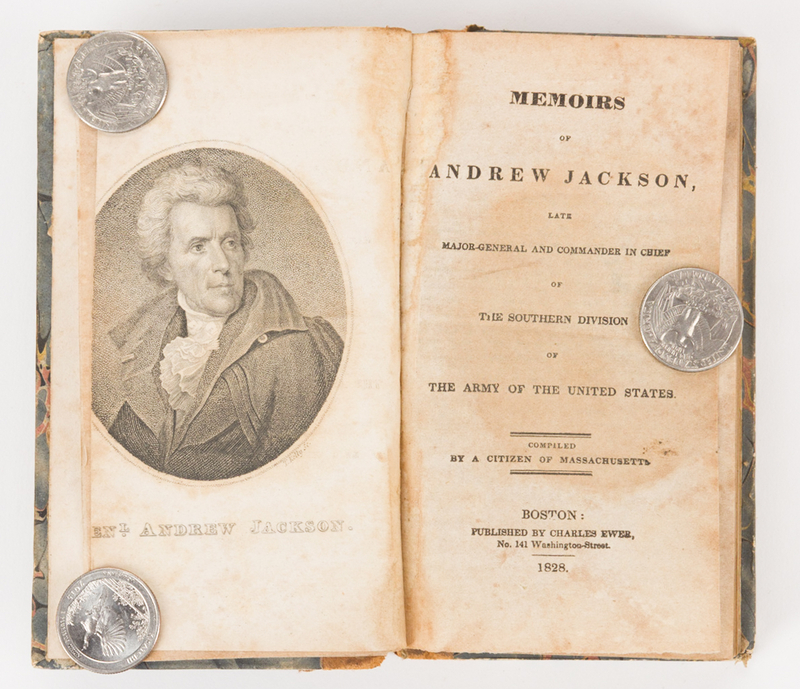 Four (4) President Andrew Jackson Related Books. 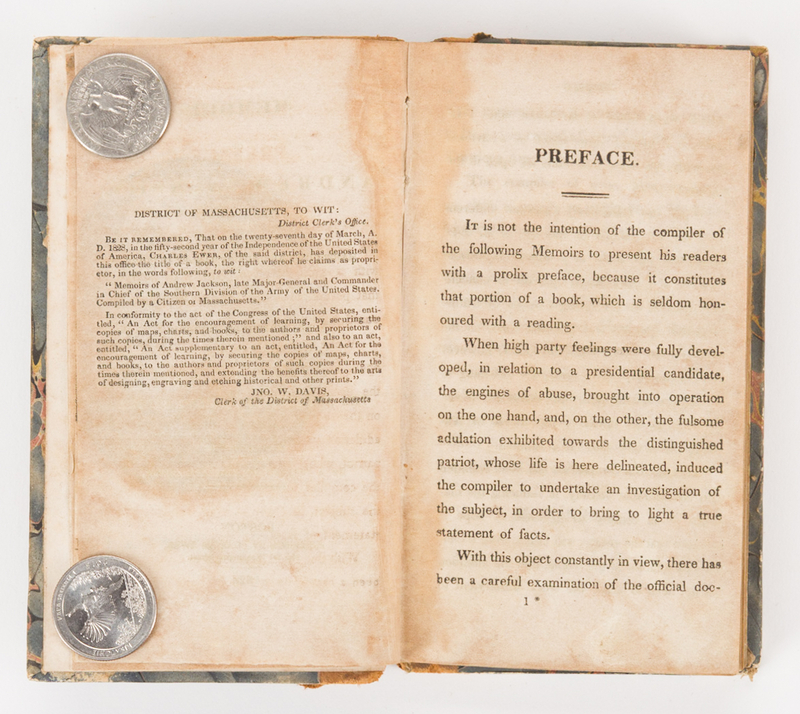 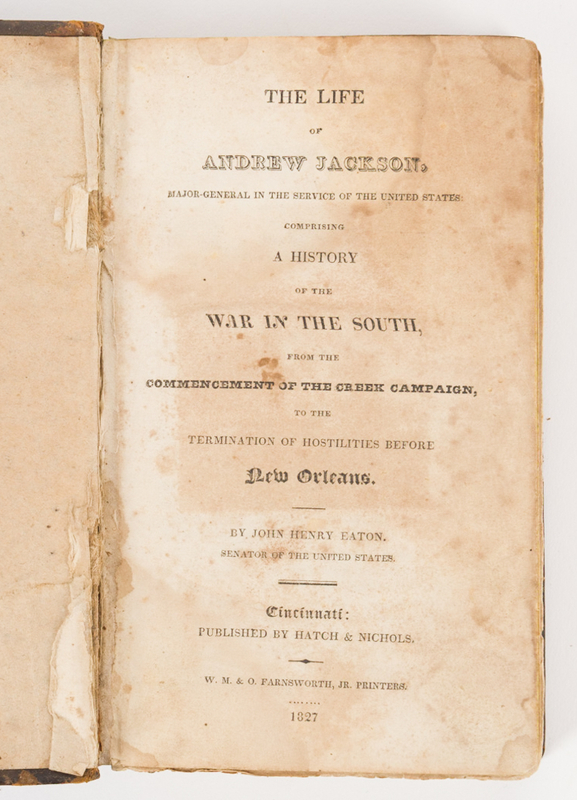 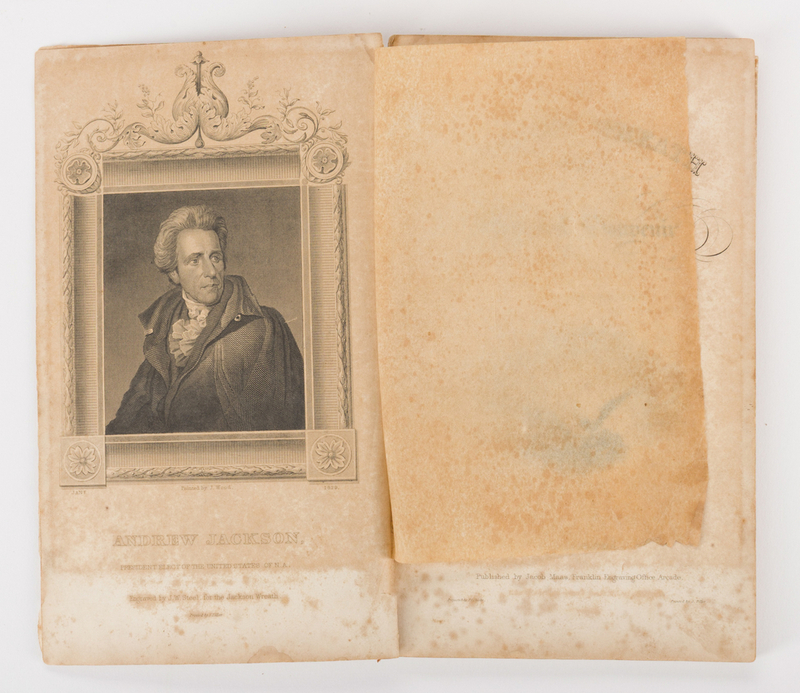 1st item: THE LIFE OF ANDREW JACKSON, MAJOR GENERAL IN THE SERVICE OF THE UNITED STATES: COMPRISING A HISTORY OF THE WAR IN THE SOUTH, FROM THE COMMENCEMENT OF THE CREEK CAMPAIGN, TO THE TERMINATION OF HOSTILITIES BEFORE NEW ORLEANS by John Easton, published by Hatch & Nichols, Cincinnati, 1827. 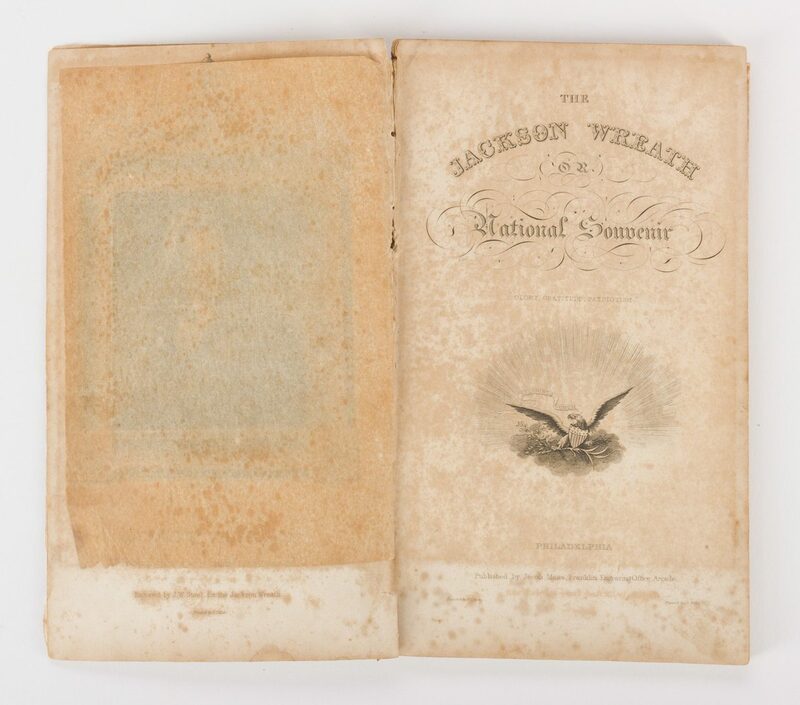 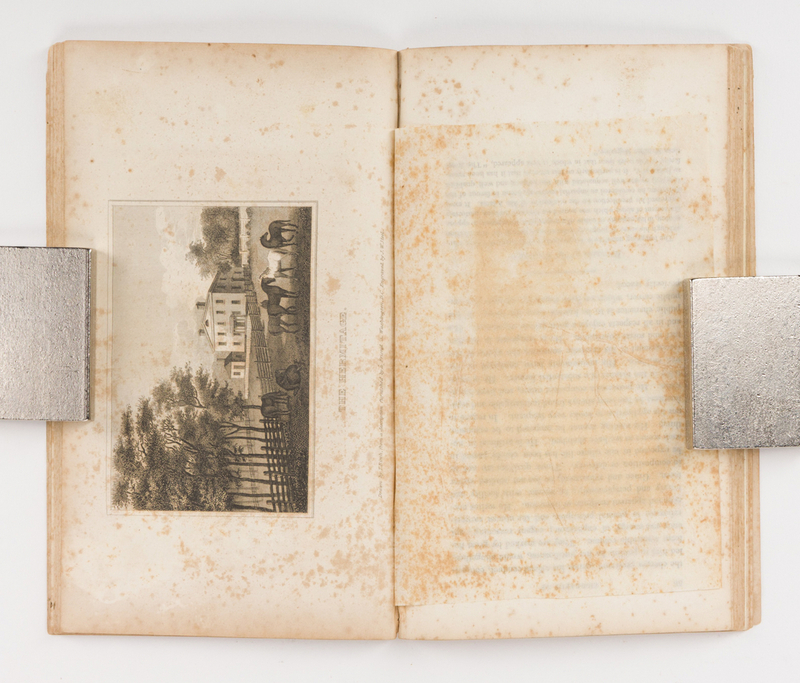 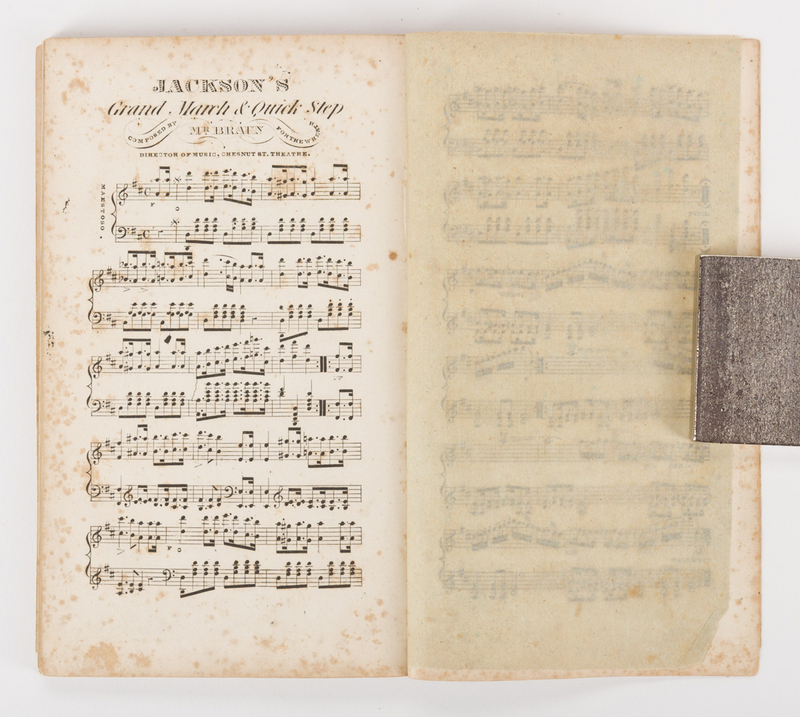 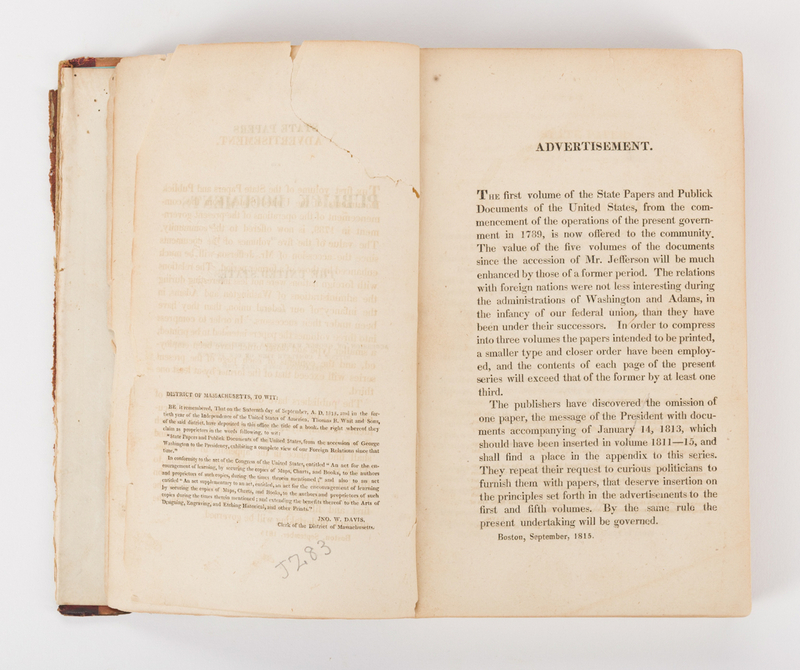 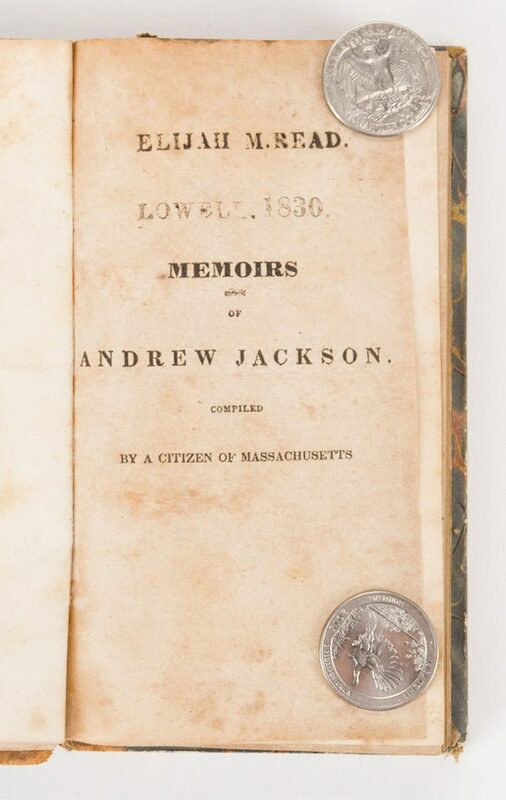 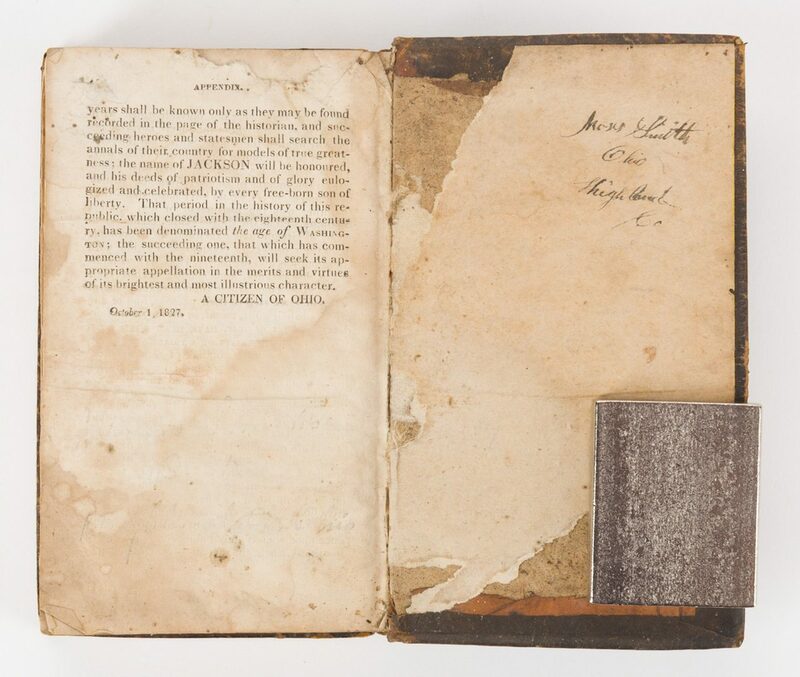 7-3/8"H x 4-1/2" W x 1-1/2" D. 2nd Item: MEMOIRS OF ANDREW JACKSON, LATE MAJOR-GENERAL AND COMMANDER IN CHIEF OF THE SOUTHERN DIVISION OF THE ARMY OF THE UNITED STATES Compiled by a Citizen of Massachusetts, published by Charles Ewer, Boston, 1828. 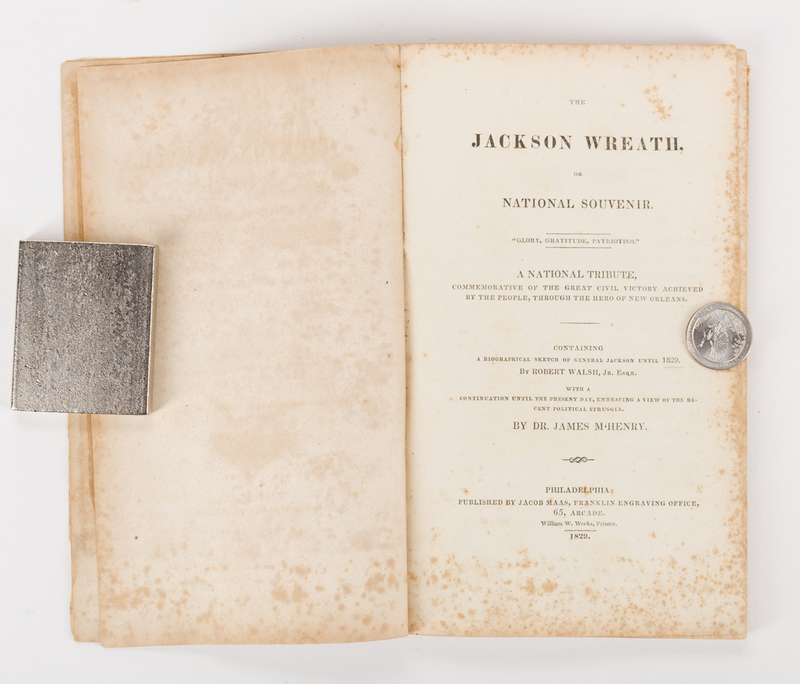 5-7/8" H x 3-1/2" W x 1" D. 3rd Item: THE JACKSON WREATH OR NATIONAL SOUVENIR, published by Jacob Maas, Franklin Engraving Office, Philadelphia, 1829. 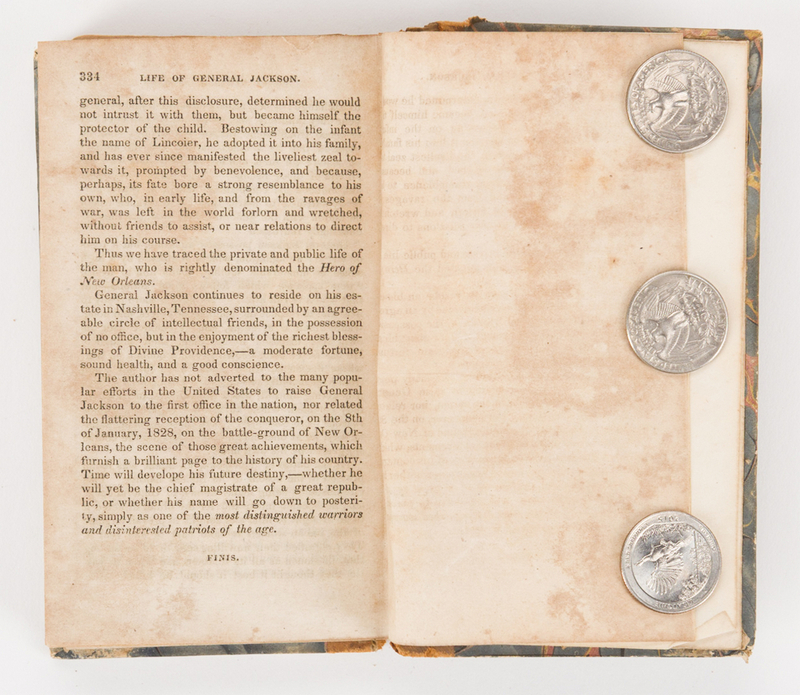 8-1/2" H x 5-1/8" W x 1/2" D. Includes engravings of Andrew Jackson, The Battle of New Orleans, and the Hermitage. 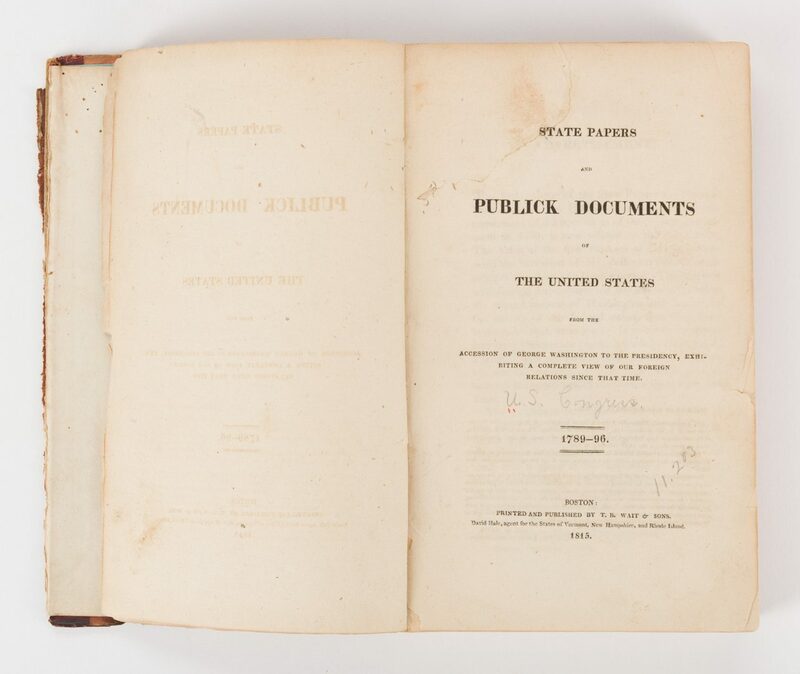 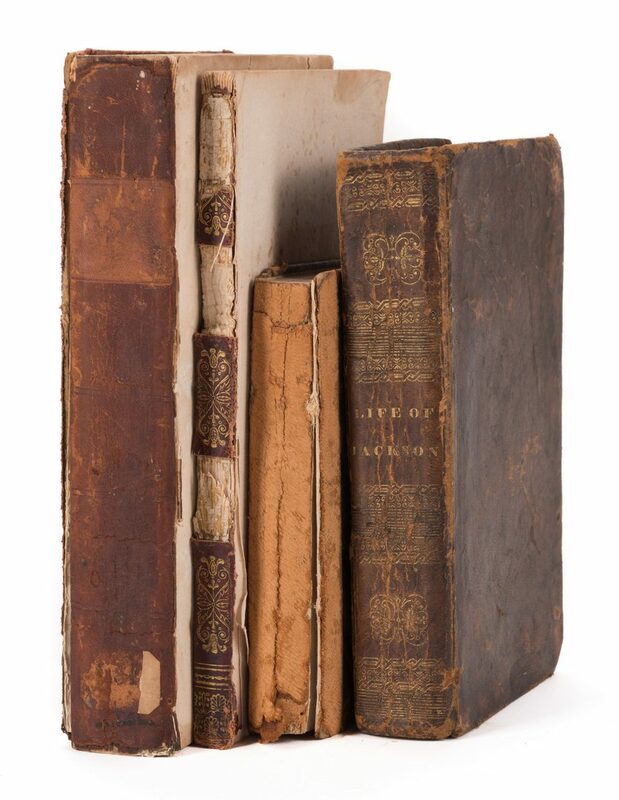 4th Item: STATE PAPERS AND PUBLICK DOCUMENTS OF THE UNITED STATES FROM THE ACCESSION OF GEORGE WASHINGTON TO THE PRESIDENCY, EXHIBITING A COMPLETE VIEW OF OUR FOREIGN RELATIONS SINCE THAT TIME, 1789-96, published by T.B. 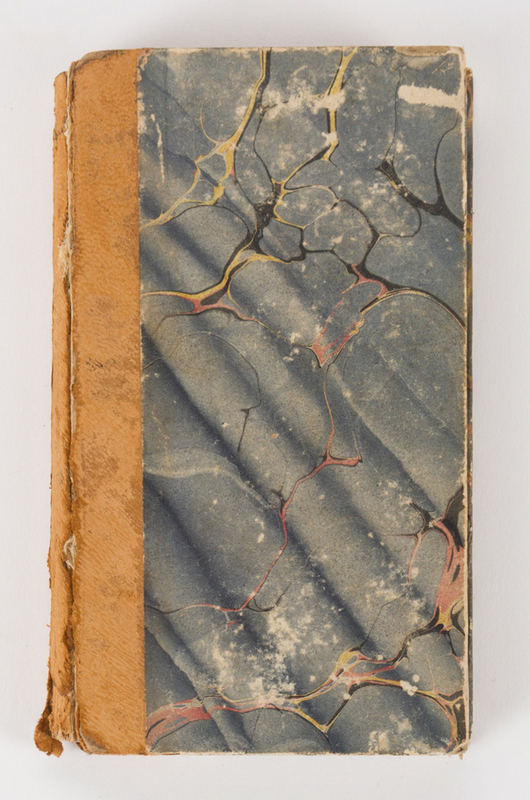 Wait & Sons, Boston, 1815. 8-1/2" H x 5-3/8" W x 1-1/4" D. CONDITION: 1st Item: Foxing and staining throughout, wear to covers, missing first few end papers, loss to back pasted end paper. 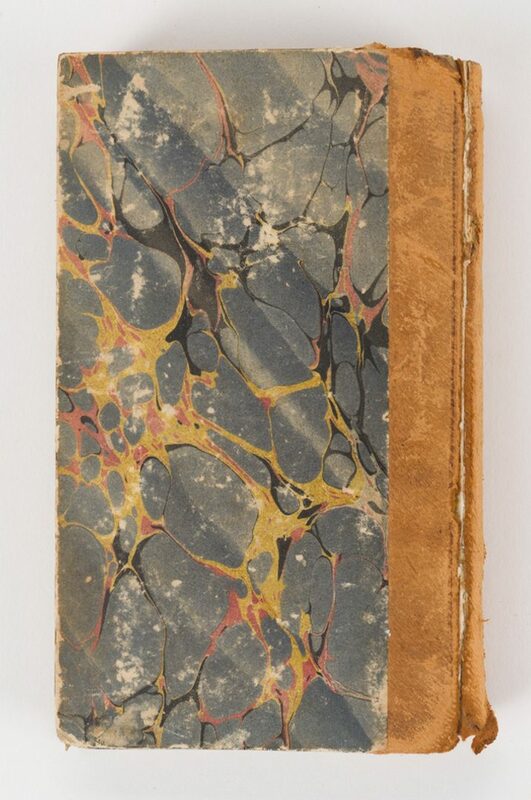 Personal inscription, inside of back cover. 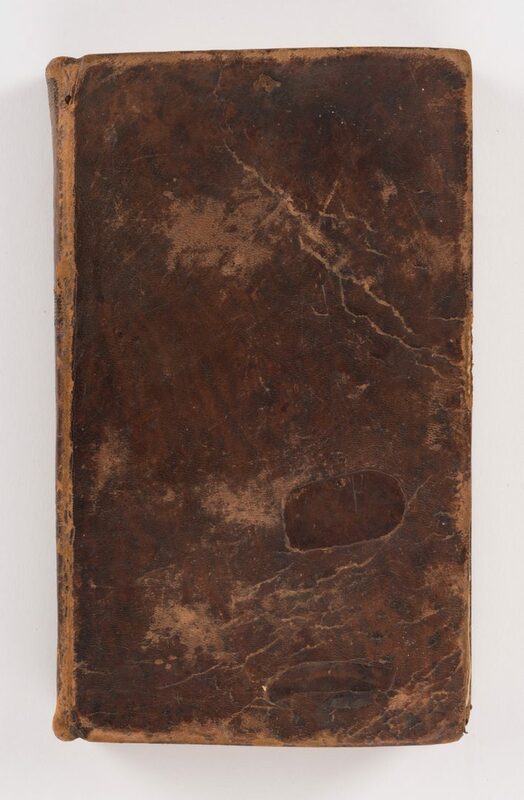 2nd item: Wear to covers and spine cover, Staining and foxing throughout. 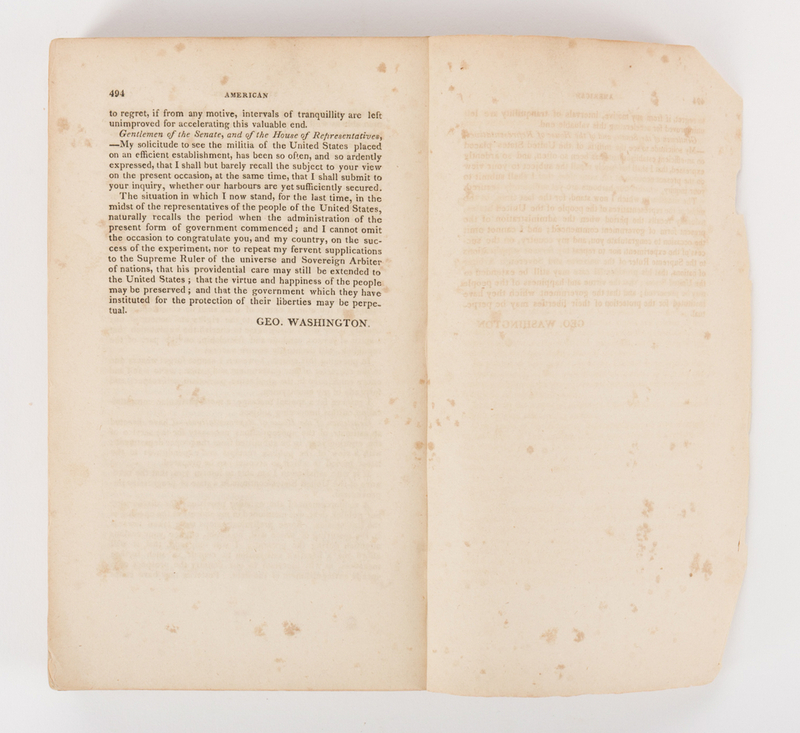 3rd item: Missing back cover, back cover missing, damage to spine cover, foxing throughout, 4" tear to free end leaf. 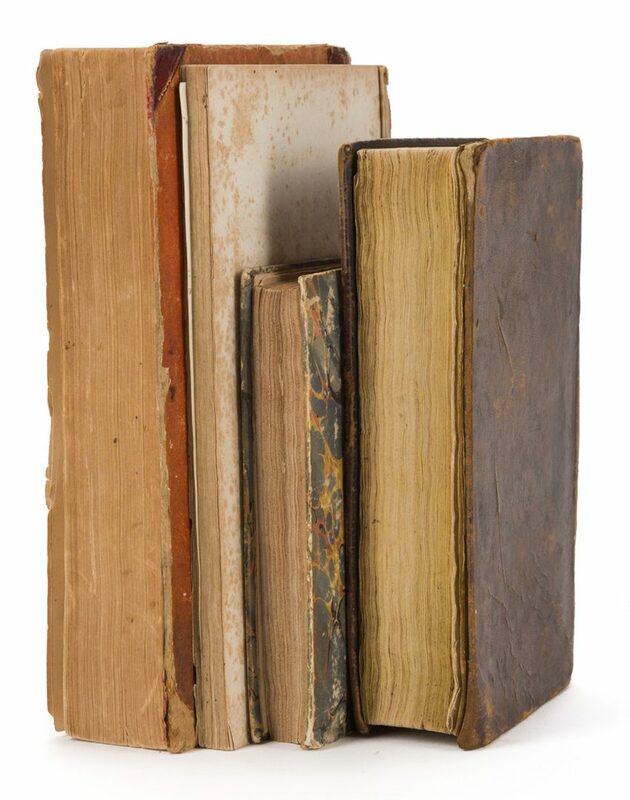 4th item: Missing both front covers, wear to spine cover, repaired 3" tear to cover page.